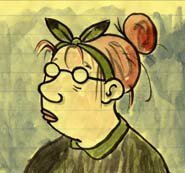 I never met Lynda Barry, but I caught up with her work in a faculty and staff writing workshop today. After being introduced to her book What It Is, we saw a short video featuring Lynda. The book and video got me wanting to write. One of our teachers led us in an exercise where we chose a word that was written on a slip of paper and many slips were placed in a paper bag. Upon reaching into the bag and choosing a word, we were to write down the first five things that came to our heads based on the word we chose. Then we had to choose one of the five and write about it. The room was stone quiet. Everyone, and I mean everyone, wrote for five minutes. Those who chose to share their work helped all of us understand that writing can be fun. I love faculty and staff meetings that are inspirational, helpful, and not led by the head of school.